There are basically 3 different types of portable satellite systems. #1 Manual Point - Hands on stationary units (Manually locate the signal). Parked / Stopped / Docked - TV & DATA units. #2 Automatic Point - Self Aligning stationary units (Automatically locate the signal). #3 Automatic In-Motion - Fully Automatic (Works on the move. Underway, in-motion). 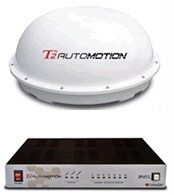 Land, air and sea fully automatic auto tracking In-Motion TV & DATA units. Please select a dish type and/or desired options then click "Add" for a bundled discounted kit price. All dish antennas come complete with LNB and hardware. Description: Discounted KIT - This is all you really need. It's fast, cheap and comes complete. Select your dish type along with other options and receive a discounted price. 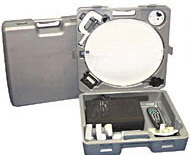 Typical kit comes complete with dish, LNB, tripod, signal meter and 50' of cable. 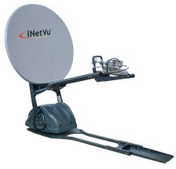 Works great with your camper or trailer satellite TV system. Ideal for RV owners. Self supporting heavy-duty Tri-Pod. Description: This satellite dish tripod is made of heavy duty galvanized steel This satellite dish tripod works great where no drilling and permanent mounting is permitted. This tripod also works great with your camper or trailer satellite TV system. Ideal for RV owners. 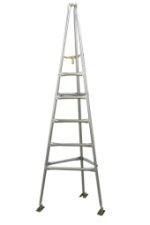 Self supporting heavy duty Tri-Pod tower made of 1-1/4" galvanized tubing. Spider mast holder attached to tri-pod legs with solid 1/4" bolts & special lock nuts. Description: Small light weight tripod you can set up in minutes. Actually it's quite annoying. It's too light so the wind blows it over. I really can't stand pointing a dish on this thing... Try to get the EZRV or just make one out of a flowerpot and fence pole. comes with detachable legs, level and compass but still not worth it. Description: The tripod satellite stand features a totally independent turning mechanism for turning any portable satellite dish with a diameter of up to 90cm while maintaining elevation alignment. Comes complete with ground pegs for added stability. It's lightweight design easily folds down to minimize storage space. Description: Truly portable Easy to setup/find satellite Folds for carrying and storage. 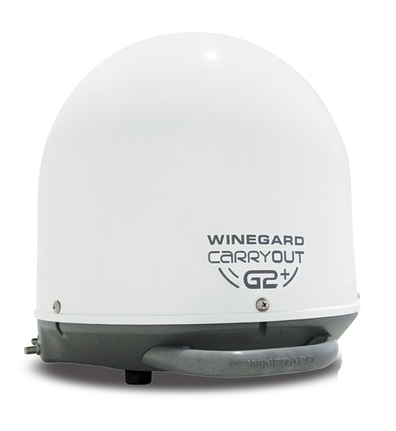 Winegard's portable system is lightweight, easy to set up and ready to go whenever you are. Two antenna sizes are available - 18 inch (46cm) and 24 inch (60cm). The antenna and base are completely and permanently assembled. The base has a built in level and compass. There is a convenient handle on the side for carrying and 25 feet of cable permanently stored in the bottom of the base. Setup is easy. crank up system is easy to install and simple to operate. The field proven lift assembly has an operating radius of only 17 inches. Antenna is raised, rotated, and lowered to travel position using the hand crank inside the RV. This system is so compact it will fit on almost any recreational vehicle. Control parts are sturdy molded plastic. The system is 28" inches high when raised, 12" inches high in travel position, and weighs 13 pounds. Raises/lowers from inside RV. 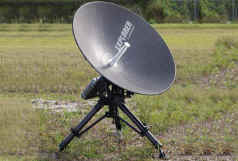 Winegard Digital RV Satellite Antenna 18 inch If you want RV satellite TV viewing Winegard offers the hand crank. It includes an 18inch antenna and lift system LNBF and installation hardware. Description: Winegard´s combination 18" digital DSS or DISH Network satellite dish and compact omni directional VHF/UHF antenna. you have one mount and one install. 18in DSS RV satellite. antenna and omni off air RV TV antenna. 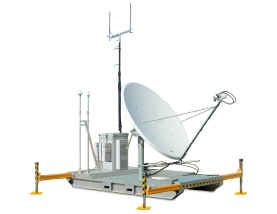 Truly portable Combination digital satellite and off-air antenna. Easy to setup/find satellite Folds for storage. crank up system is easy to install and simple to operate. A field proven lift assembly antenna is raised, rotated, and lowered to travel position using the hand crank inside the RV. This system is so compact it will fit on almost any recreational vehicle. Control parts are sturdy molded plastic. Combination digital satellite and off-air antenna. Description: Ideal solution for situations on-the-go. 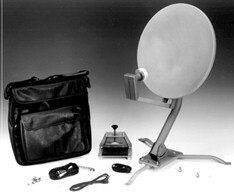 This 3.1 elliptical dish comes complete with trailer and hardware for easy fast deployment on the move. Larger dish better performance and portability. Call today. Several options available. Ask about the Rent Me Program. All dish antennas are available in different feed and LNB configuration. Description: Ideal solution for situations on-the-go. 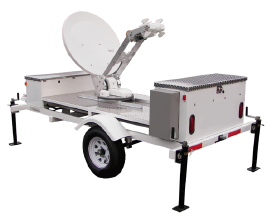 This 3.8 offset dish comes complete with trailer and hardware for easy fast deployment on the move. Larger dish better performance and portability. Several options available. Ask about the Rent Me Program. Description: Ideal solution for situations on-the-go. 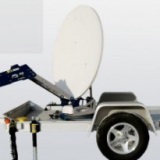 This 5.0 flap over offset dish comes complete with trailer and hardware for easy fast deployment on the move. 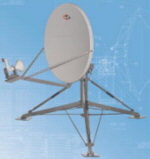 Larger dish better performance and portability. Several options available. Ask about the Rent Me Program. All dish antennas are available in different feed and LNB configuration. Description: Satellite communication antenna with the advantage of miniaturization and portability. Available for a wide range of applications, containing remote areas, island, village, oil filed, mina area, finance, transportation, civil aviation, environment, water power, electric power, geology, salvage, rescue, and emergency. Aluminum material High gain and excellent sidelobe performance. Simple and robust structure. Quick assembly within 5 minutes. Description: Aluminum and fiber antenna in the light of material. Can support such communication service as voice, data and fax. It can solve the problem that wired communication, such as electric cable and optical fiber. Aluminum material High gain and excellent sidelobe performance Simple and robust structure. Quick assembly within 10 minutes. Description: Satellite communication antenna with the advantage of miniaturization and portability. Available for a wide range of applications, containing remote areas, island, village, oil filed, mina area, finance, transportation, civil aviation, environment, water power, electric power, geology, salvage, rescue, and emergency. Aluminum material. High gain and excellent sidelobe performance. Simple and robust structure. Quick assembly within 5 minutes. Description: Newly designed Ku-band or C band satellite communication antenna. This 2.4m manual Flyaway Antenna is composed of four parts: support legs, antenna host machine, antenna reflector and feed system.2.4m Flyaway Antenna System composition: Offset reflector antenna AZ & EI rotary type 2.4m Flyaway Antenna System features: Have superior RF performance through optimized design of reflector and RF branch Adopt carbon fiber offset antenna, whose reflectors are with features of light weight, high strength, simple & convenient disassembly and assembly. One person can finish assembly within 5 minutes Have rapid and high-quality broadband transmission at any time and place. The antenna is with high integration and light weight. Description: .75 meter Delivering a lightweight, yet rugged 2-axis solution for versatile multi-band VSAT operations. Choose EXPLORER 3075 for lower cost, high performance connectivity. Description: EXPLORER 3075GX is a rugged and portable manual point Fly-Away system configured specifically for operation on the Inmarsat Global Xpress® (GX) network. The terminal is configured for commercial band operations and includes a fully integrated iDirect Core Module. The user friendly design allows operators with little satellite experience to access GX services within minutes. Description: These 30" portable antennas consist of composite reflectors and aluminum tripod base mounts. This results in a low-weight antenna with superior stiffness and high performance under wind loading conditions. Description: 1.8 meter Patriot Flyaway Antenna, is aircraft baggage checkable. Patented four piece for easy transportation. Pre-assembled tripod base mount with pull pins. All aluminum cases for easy transportation. Transmit/Receive Antenna aircraft baggage checkable! The system can be field assembled by two people in less than one hour, with all necessary hand tools provided. Ultra portable terminal in two ergonomically designed backpacks that meet airline check-in requirements 4, 8, 15W BUC/SSPA Up to 4.0Mbps transmit and receive operation. All dish antennas are available in different feed and LNB configuration. Description: 2.4 meter is aircraft baggage checkable! The system can be field assembled by two people in less than one hour, with all necessary hand tools provided. All dish antennas are available in different feed and LNB configuration. The unique optical shape and accurate reflector surface provide good sidelobe and excellent cross-polarization performance. Repeatability is maintained with precision registration of the nine-piece reflector segments and RF components. Description: Complete with cases. perfect for TV broadcasting to 4.0Mbps transmit and receive operation Auto-acquisition opts. All dish antennas are available in different feed and LNB configuration. Aluminum lighter weight. The cases that meet airline check-in requirements for these things can get expensive but surly worth it. They runaround $3,000.00 - $5,500.00 soft case or hard case. Please call for current pricing. Description: Rugged Deploy are generally hard steel galvanized for harsh environments and don't always comply with crosspol UNISAT codes. .8 F/D These dishes are heaver than the quick deploy series. All dish antennas are available in different feed and LNB configuration. Please call. Description: Up to 4.0Mbps transmit and receive operation Auto-acquisition opts. All dish antennas are available in different feed and LNB configuration. Description: Ideal solution for situations on-the-go. This 1.8 & 2.4 transportable dish comes complete with trailer and hardware for easy fast deployment on the move. Larger dish better performance and portability. Several options available. Ask about the Rent Me Program. Description: Andrew 4.5 m prime focus Trifold® earth station antenna provides high gain and exceptional pattern characteristics. The Trifold® aluminum reflector panels are cut from a single-piece precision spinning. Panel design and manufacture provides excellent thermal expansion characteristics and ensures extremely accurate surface contour. The Trifold® design enables manual antenna deployment by one person in less than 30 minutes. Description: Ideal solution for situations on-the-go. This 5.0 fold over prime transportable dish comes complete with trailer and hardware for easy fast deployment on the move. 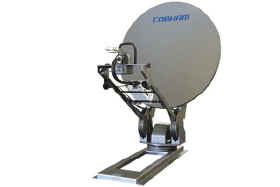 Larger dish better performance and portability. Call today. Several options available. All dish antennas are available in different feed and LNB configuration. Description: Ideal solution for situations on-the-go. This 5.0 offset transportable dish comes complete with trailer and hardware for easy fast deployment on the move. 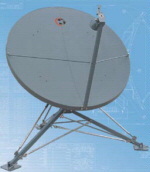 Larger dish better performance and portability. Call today. Several options available. Ask about the Rent Me Program. 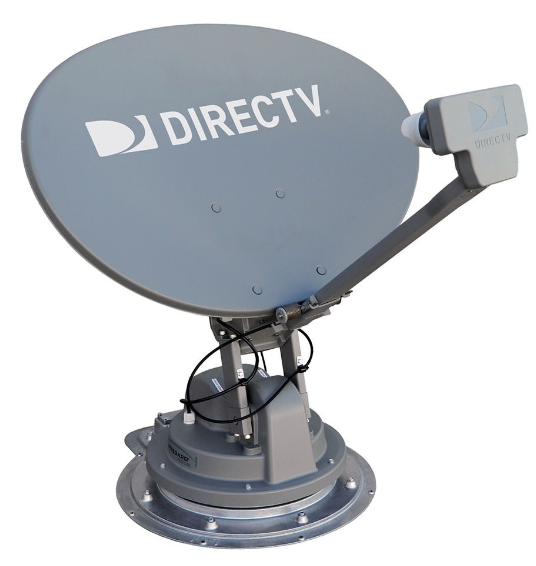 Description: 5 LNB antenna provides complete coverage of all DIRECTV standard and HD programming. 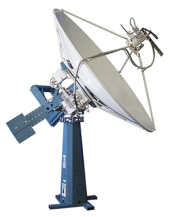 Receives both KU-band (101°, 110°, 119°) and KA-band (99° & 103°) satellite signals simultaneously. No other mobile antenna is currently capable of receiving KA-band signals! From Winegard. Description: Traveler Shaw Direct Satellite TV Auto Antenna. 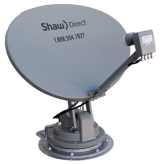 Works with Shaw Direct Satellite TV Antenna Reflector and LNB to bring Star Choice satellite viewing on the road in your RV. Fully automatic mounting base allows simple one-button operation to raise, lower and position satellite TV antenna effortlessly. From Winegard. Description: Enjoy satellite programming as easily as at home, with no compromises in convenience or performance. 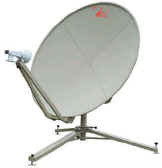 DISH Network’s premier reflector dish used for home systems. Automatic, one button on/off antenna views all satellites at the same time for maximum reception performance. Works great with DVRs! Receives all DISH Network standard and HD programming from satellites 110º, 119º and 129º simultaneously. Also receives all Bell TV standard and HD programming from satellites 82º and 91º simultaneously. From Winegard. 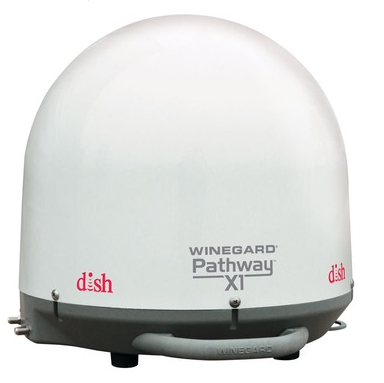 Description: Designed exclusively for DISH satellite TV programming, the Pathway X2 antenna is powered through a DISH ViP 211 series HD receiver (sold separately), requiring no separate power cord. Pathway X2 can point to either Western or Eastern arc satellites, offering the most programming available. 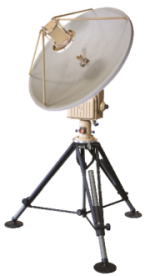 Larger reflector size provides superior signal performance compared to other automatic portable satellite systems. Lightweight yet rugged, the Pathway X2 offers the fastest, easiest set up. Features 2 coax inputs for multiple receiver hook-up. From Winegard. 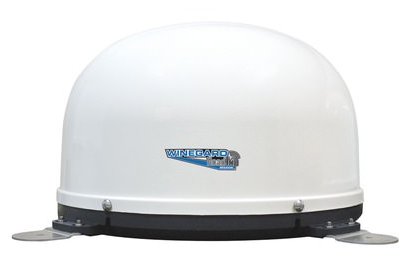 Description: Fully automatic Tailgater and Quest portable satellite antenna sits on the ground or permanently mounts to the roof of your RV. Enjoy all your favorite TV programs anywhere, anytime including local networks. This small, easy to use, fully automatic antenna gives you the freedom to take your favorite programming with you on the road, to the great outdoors or anywhere in between. From Winegard. 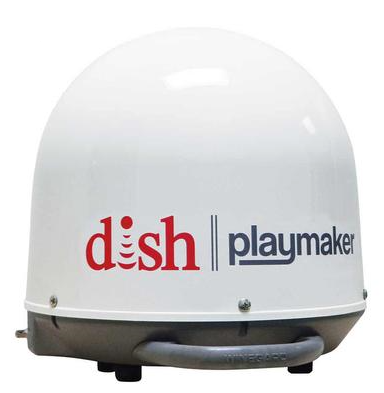 Description: The NEW DISH Tailgater is a fully automatic portable HD satellite antenna that sits on the ground while you're watching the big game in the parking lot or permanently mounts to the roof of your RV. Description: Ultra-lightweight and compact satellite antenna requires minimal space and is fully automatic. Power Inserter removes the need for a separate power cable and lets you switch providers from inside your RV. Works with DISH, DIRECTV and Bell TV programming (receiver and programming package sold separately). Made in USA. From Winegard. 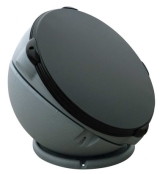 Description: The smallest portable satellite antenna stands only 14.3" dia. x 13.5"H and weighs only 10 lbs Fully automatic—just select your state and the Pathway X1 automatically finds DISH satellites. Faster satellite acquisition than other automatic antennas. Requires no separate power cable--powered by coaxial cable from the primary receiver. Watch programs on up to two TVs (two receivers required). Easily converts to roof mount (roof mount kit sold separately). Integrated security handle lets you lock it up to prevent theft. Compatible with DISH Pay-As-You-Go ViP 211z Receiver (sold separately) for SD and HD programming (receiver and programming package sold separately). Mfr. 2 year parts, 1 year labor warranty. From Winegard. Description: Playmaker by Winegard is the perfect traveling companion whether your are tailgating or camping. It's the lowest cost portable satellite antenna in market today and offers a sleek, compact design. 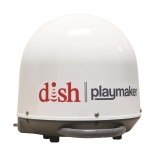 The DISH Playmaker works exclusively with DISH HD Solo receiver technology and Pay-As-You-Go programming. This antenna supports one receiver and is 100% automatic so it's simple to use and effortless to set up. Description: It's rugged durability and simple design are the key elements behind the Executive's longevity as a tested mobile satellite system. The end of the OSD marked a new era in the Executive's development enabling it to reach further and operate more efficiently under the new Nomad Universal DVB Controller. Coupled with the Nomad's easy push button operations, the Executive is once again slated to attain new heights with extended usability and renewed life. Description: MHDTV DirecTV Triple fold down. 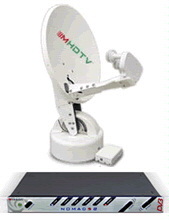 The new Nomad MHDTV is the first self-skewable HDTV dish for mobile satellite TV. 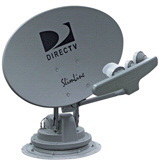 Its triple LNB enables the MHDTV to receive high definition DirecTV HDTV signals. High Definition TV is the future of television broadcasting using digital signals and super crisp resolution. Newer TVs are using this new platform standard for hyper life-like picture and digital sound. The MHDTV brings this standard to the mobile satellite TV world giving you the opportunity to combine the lifestyle of freedom you love, with 21st century technology found in the Nomad MHDTV. Description: Receives up to 200 channels of digital television and audio programming from DirecTV or Dish Network satellites. Viewing in areas with unobstructed view to the satellite, in the lower 48 states. 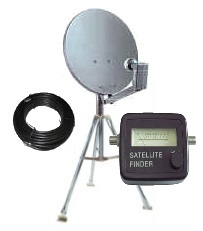 Compatible with most satellite receivers with wideband data port. Stows to low 9" height to cut wind resistance. Quick and easy installation by authorized dealers nationwide. Heavy-duty design built in the USA. Two-year parts, one-year labor limited warranty Marine version available refer to "The Premier" DBS-3200 DBS-3000 DBS-4000 marine. Description: This Winegard System is totally automatic! Compatible with Dish 500, the receiver will toggle between 110° and 119° with Global Positioning System technology (GPS). 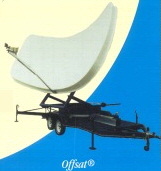 Winegard Auto Satellite Antenna. Description: Have the freedom to enjoy your favorite shows. Forget the DVDs. 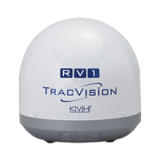 Make the most of your time on the road and choose an award-winning TracVision from KVH – the best, most reliable satellite TV antenna systems for RVs and motor coaches. 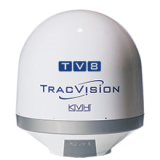 KVH’s TracVision satellite TV antenna systems. 14.5"x 32" 33 lbs Available in white, Black or Gray. 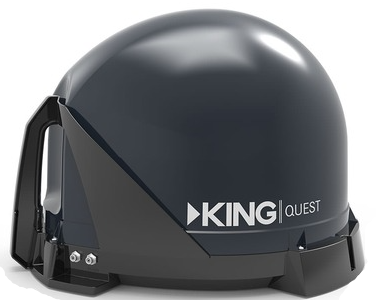 Description: Designed for RV satellite signal acquisition when you're parked. Wingards One button on-off operation no user input and the same attractive appearance compatible with every vehicle. Description: TracVision M2 “at anchor” satellite TV system is a great choice for boaters who want to enjoy premium DIRECTV® programming while at anchor or at the dock. Description: Ideal solution for situations on-the-go. 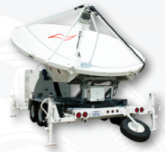 This 3.8 - 4.5 - 5.0 offset dish comes complete with trailer and hardware for easy fast deployment on the move. Larger dish better performance and portability. Several options available. Ask about the Rent Me Program. Description: Go where cell access is not available. 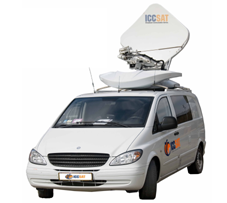 The Toughsat Flyaway mobile satellite system is easily transported and deployed by one person for high speed connectivity using Commercial Grade iDirect from any location. With an integrated wireless access point, this satellite solution can become a multi-user hotspot in minutes. And with Dual Matrix service, you can choose from one of two satellites with a touch of a button (North America only). Description: The iNetVu® Ka-75V Drive-Away Antenna is a 75 cm auto-acquire satellite antenna system which can be mounted on the roof of a vehicle for direct broadband access over any configured satellite. The system works seamlessly with the iNetVu® 7024C Controller providing fast satellite acquisition within minutes, anytime anywhere. Approved for use on Exede Ka Service by ViaSat and on KA-SAT NEWSSPOTTER NEWSGATHERING service by Eutelsat. Description: The iNetVu® Ka-98H Drive-Away Antenna is a 98 cm auto-acquire satellite antenna system which can be mounted on the roof of a vehicle for Broadband Internet Access over any configured satellite. The system works seamlessly with the iNetVu® 7024C Controller providing fast satellite acquisition within minutes, anytime anywhere. Description: The iNetVu® Ka-98V Drive-Away Antenna is a 98 cm auto-acquire satellite antenna system which can be mounted on the roof of a vehicle for direct broadband access over any configured satellite. The system works seamlessly with the iNetVu® 7024C Controller providing fast satellite acquisition within minutes, anytime anywhere. Description: The EXPLORER 7100GX 1 meter antenna ensures the simplicity and convenience of one-touch control for hassle-free configuration and superior portability. The controller has built-in RF Tuner, Compass, GPS, GLONASS and inclined orbit satellite tracking for precise and convenient drive-away VSAT operations. Description: High-performance low-profile 1.8m Ku-band drive-away antenna for reliable vehicular connectivity. Choose EXPLORER 7180 for easy installation and extensive possibilities for streaming and high-end broadband data applications. 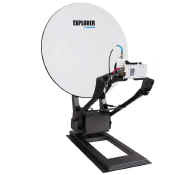 Description: Developed completely in-house by Cobham SATCOM, the one meter EXPLORER 8100 Auto-Acquire Drive-Away antenna is designed to offer unparalleled performance, ensuring high quality connectivity on any Ku- and Ka-band networks. Description: Common Data Links (CDL) and Tactical Common Data Links (TCDL) systems cover all bands, X, C, Ku, Ka and Q family of portable data link antennas used in real-time relay of information for reconnaissance and surveillance purposes, such as quick-deploy man portable terminals, multi-function shipboard systems and high-mobility trailer mounted surface terminals. Description: The MVS Series allows non-skilled personnel to operate mobile Very Small Aperture Terminal (VSAT) satellite communications equipment enabling the user to access any broadband application over satellite. Description: In motion Internet isn't here yet. Not Available / Doesn't Exist. ( well on a consumer level anyway. Very soon please call the office.) But there's good news !!! Try the mobile phone carriers. They have some DSL like speeds. In - Motion Internet Broadband on the road. All dish antennas are available in different feed and LNB configuration, C, X, Ku, K, Ka,	and Q-band. Description: In motion Internet In - Motion Internet Broadband on the road. All dish antennas are available in different feed and LNB configuration, C, X, Ku, K, Ka,	and Q-band. Description:2.4- 2.5	m	Nomadic	is	a	highly	flexible	antenna	system	designed	to	operate	on	almost	any	satcom	band	and	in	many	configurations. The	entire	reflector	structure	consists	of	lightweight	carbon	fiber	panels,	with	multiple	mounting	scenarios,	and	can	be	ordered	in	motorized	or non-motorized versions With	feeds	available	to	address L, C, X, Ku, K, Ka,	and	Q-bands,	as	well	as	low	PIM	capable	feeds,	few	applications	are	beyond	its	capabilities. Description: Flyaway antenna can support such communication service as voice, data and fax. Features Aluminum or Carbon fiber material. Easy deploy and fast field assembly without any tools. High gain and excellent sidelobe performance. Simple and robust structure. Quick assembly within 5 minutes. Packed in one case or backpack Aviation package. Description: The flyaway Vsat Antennas can be fallen into two categories: aluminum and fiber antenna in lightweight material. Flyaway Antenna Features Aluminum or Carbon fiber material. Easy deploy and fast field assembly without any tools .High gain and excellent sidelobe performance. Simple and robust structure. Quick assembly within 5 minutes. Packed in one case or backpack Aviation package. Description: The versatile and durable BGAN M2M terminal, EXPLORER 540, is the world's first Machine-to-Machine (M2M) communication terminal to operate on both Inmarsat BGAN (Broadband Global Area Network) and 2G/3G/LTE networks. Description: EXPLORER BGAN is a series of L-band satellite terminals utilizing the BGAN network from Inmarsat. An EXPLORER BGAN terminal offers a broadband connection and telephony service from anywhere in the world. Every terminal features easy set-up and operation. Simply connect a PC or phone, point the terminal towards a satellite using the compass and sound indicator, and you are instantly connected from anywhere in the world. 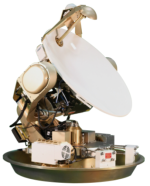 Description: AQYR’s TYPHOON Auto Acquire 1 meter SATCOM Terminal is the next-generation of rapidly deployable satellite communication terminals. Comprised of a lightweight carbon ﬁber reﬂector, patented auto positioner, and compact integrated RF components, the terminal is fully operable from the auto positioner or can be accessed through a remote GUI to manage network proﬁles and view real time updates. TYPHOON is designed to be modem and satellite service agnostic, but offers signiﬁcant system-level integration with Maverick, Newtec and iDirect Evolution class modems. Description: EXPLORER 5075GX is a rugged and portable auto-acquire Fly-Away system configured specifically for operation on the Inmarsat Global Xpress® (GX) network. The terminal is configured for commercial band operations and includes a fully integrated iDirect Core Module. The user friendly design allows operators with little satellite experience to access GX services within minutes. Description: The tactical Ground Datalink Antenna (GDA) was designed for quick deployment in harsh environments, and can be deployed in less than 5 minutes with no hand tools required. 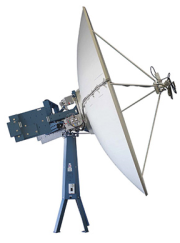 A standard 36 inch lightweight composite parabolic reflector provides high antenna gain. Description: The HD-30T series tactical Ground Data Terminal was designed for quick deployment in harsh environments. The HD-30T can be deployed in less than 15 minutes with no hand tools required. A standard 1.2 meter segmented parabolic reflector provides high antenna gain and a quickly deployable 1.0 meter FLAPS™ Reflector is also an option for the HD-30T. The system’s Antenna Control Unit, Servo Amplifiers and Power Supplies are self-contained in the pedestal base. Operator interfaces for command and control are provided through an Ethernet UDP/IP port and a serial control interface is optional. Description: Simple & convenient disassembly and assembly. One person can finish assembly within 5 minutes Have rapid and high-quality broadband transmission at any time and place. The antenna is with high integration and light weight. Description: The system Antenna Control Unit (ACU), Servo Amplifiers and Power Supplies are self-contained in the pedestal base. Operator interfaces for command and control are provided through an Ethernet UDP/IP port and a serial control interface is optional. The GDA-36CB features mounting provisions for Radio Frequency Equipment (RFE) and modem directly behind the reflector. 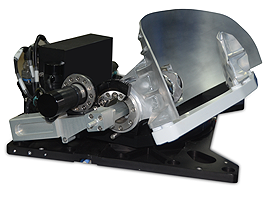 This provides optimum RF performance and eliminates the need for rotary joints. Extra channels on the slip ring provide command and control pathways. Description: The DataStorm F1 .74 meter mobile internet satellite system is the first true two-way system approved by DirecWay and the FCC. Designed to automatically acquire the internet satellite in the sky, the DataStorm F1 uses motors, gears, and a GPS system to adapt to the mobile environment. It's unique fold-down design [10.5" when stowed] lets most vehicles become a stable platform for installation. The D series controller gives the DataStorm F1 true plug-and-play capabilities with any computer or network. Currently compatible with the DirecWay and other new and exciting options. Description: The TCC Carrier is the ideal solution for situations on-the-go, requiring an easy to access data satellite system. The TCC Carrier is compatible with all DataStorm F and XF series mounts. 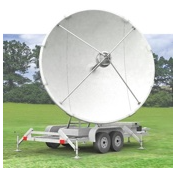 The TCC Carrier's custom made trailer All dish antennas are available in different feed and LNB configuration. Description: The modular 3.7M Trifold transportable design enables one-person deployment in less than 30 minutes. A large range of adjustment provides non-critical positioner / trailer orientation and the ability to view geostationary satellites, horizon-to-horizon, from any location worldwide. Description: The TCC Lander is the ideal solution for emergency situations requiring immediate access to bandwidth. The TCC Lander is compatible with all DataStorm F and XF series mounts and incorporates an all-in-one component list including: A generator, DataStorm D3 controller, modem, WiFi router, and everything needed to set up communications the moment the Lander touches down. Description: Ground Data Terminal. The 3.1 & 3.9m system provides a complete solution for mobile communications. Its versatility allows the system to be configured to meet various customer applications, including commercial and military. Description: NIMO mini is a transportable VSAT satellite communication system that provides full functionality for voice and Internet data communications in remote locations. NIMO is available for purchase or rental on a monthly basis. Description: Combining the convenience of a 1.2m auto-deploy antenna for Ku-band operation in a versatile fly and drive VSAT. 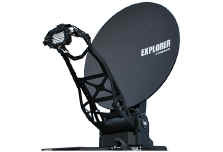 EXPLORER 5120 is easy to configure and provides access to any broadband application over satellite. Description: Ideal solution for situations on-the-go. 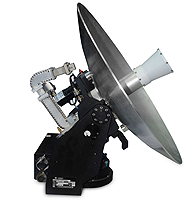 This 4.5 & 5.0 flap over offset dish comes complete with trailer and hardware for easy fast deployment on the move. Larger dish better performance and portability. Call today. Several options available. Ask about the Rent Me Program. All dish antennas are available in different feed and LNB configuration. Description: Ideal solution for situations on-the-go. 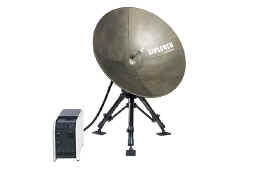 This 3.1 & 3.8 elliptical dish comes complete with trailer and hardware for easy fast deployment on the move. 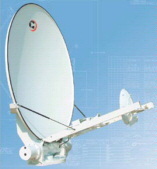 Larger dish better performance and portability. Call today. Several options available. Ask about the Rent Me Program. 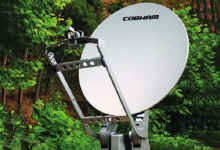 All dish antennas are available in different feed and LNB configuration. Description: In-motion; white or black dome options. The RoadTrip Mission antenna offers the same powerful and reliable performance Winegard is known for in an all-new sleek, ultra-compact antenna. Mission accomplished! 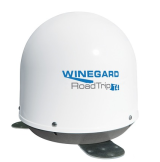 The RoadTrip Mission antenna offers the same powerful and reliable performance Winegard is known for in an all-new sleek, ultra-compact dome antenna. Easy one-button on/off automatic operation with DVB technology delivers fast and accurate satellite acquisition. 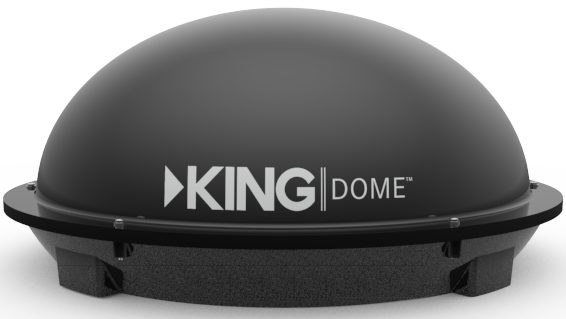 Enhanced antenna design combined with the high gloss rounded dome provide for unmatched signal strength, especially in inclement weather. Receives standard DIRECTV programming; all standard and HD DISH Network and Bell TV programming. Description: Have the freedom to enjoy your favorite shows. Forget the DVDs. Make the most of your time on the road and choose an award-winning TracVision from KVH – the best, most reliable satellite TV antenna systems for RVs and motor coaches. 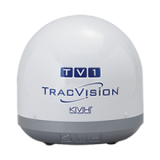 KVH’s TracVision satellite TV antenna systems Available in white, Black or Gray. Description: Winegard RoadTrip In-Motion Satellite Dish 12" Camper TV Antenna RV Mobile, DVB Technology, Express Vu, DirecTV and Dish Network. Available in Black or White. Description: Whether it's vacationing in the mountains, at the beach, or just driving, Satellite TV is now available for use in your vehicle. 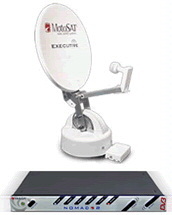 MotoSAT's ultra low-profile state-of-the-art phased array antenna can receive virtually any direct broadcast satellite TV signal while you are traveling. Traveling will be fun and exciting as your passengers view their favorite live programming. Only 2.5" high ! Sleek and attractive, the T Motion 3000 is designed and engineered to maintain a lock on the satellite in essentially any road conditions. Description: Hmmmm..., Look's incredible. With the low profile and advanced satellite technology, the T Motion 1500 meets all your TV needs while only 4.5" high. Combining high-speed azimuth tracking and electronic elevation adjustment, the T Motion 1500 is a turn it on and forget it dish. It's simple interface keeps functionality trouble free. Description: The sleek, stylish, ultra-low-profile TracVision A9 from KVH is the perfect complement to every luxury SUV or family minivan, enabling you to travel down the road with access to your favorite satellite TV programming and familiar local channels*. Ideal for in-motion applications and vehicles with height restrictions, TracVision A9 offers a new level of entertainment with live standard definition DIRECTV and high-definition DISH Network programming right on your car’s video screens. The patented, automotive-grade housing in clear-coated high-gloss black is rugged enough to withstand wind, rain, snow, dirt, and even car washes. You won’t miss that big game, traffic report, new episode, or breaking local news story again. Description: Winegard LP-1000 RoadTrip RV Satellite TV Antenna GPS Camper Low Profile Flat Mobile DSS DBS Dish Digital Signal In-Motion DVB, Works with DirecTV and Dish Network. Flat Satellite Dish. Description: TracVision RV1, you can enjoy satellite TV programming in your RV, just like you enjoy it at home. The reliable ultra-compact (32 cm, 12.5 inch) and lightweight RV1 features advanced technology that provides superior in-motion performance. 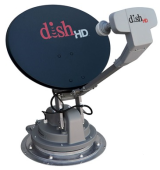 The system’s single-cable design makes it a snap to replace an existing satellite TV antenna. Installation is fast and easy so you can start enjoying TV on the road in no time. Description: Choose the versatile high-performance, HDTV-ready TracVision M3 DX and enjoy your favorite satellite TV programs from DIRECTV®, DISH Network™, ExpressVu, and Sky Mexico, along with European and regional high-powered satellite TV services from around the globe. 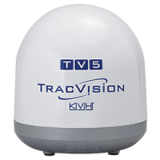 Description: With its single-cable design, compact 37 cm (14.5 inch) antenna, and device-friendly user interface, the TracVision TV3 is a snap to install, set up, and use. 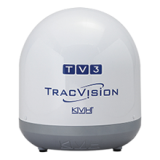 The DVB-S2 compatible TracVision TV3 is the perfect solution for single- or multiple-receiver installations. In no time, you’ll be enjoying your favorite television programming, right from your boat. Description: With 30% greater reception than other 45 cm (18-inch) systems, you’ll enjoy satellite TV reception where few others can provide it. 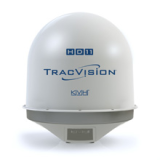 TracVision TV5 offers outstanding high performance tracking and reception, as well as compatibility with DIRECTV® U.S., DIRECTV Latin America, DISH Network®, Bell TV, and circular and linear Ku-band services worldwide. This rugged system is ideal for sport fishing boats or boats venturing offshore or to the islands. Description: With its IP-enabled TV-Hub, user-friendly interface, and single-cable installation, TracVision TV6 makes it easier than ever to enjoy your favorite television programming no matter where your seagoing adventures take you. This 60 cm (24-inch) marine satellite television antenna not only provides access to satellite television services worldwide, it supports multiple receivers so everyone onboard can watch what they want. Designed for an extended coverage area, this DVB-S2 compatible system is perfectly suited for boats heading offshore for short or long voyages. Description: One of the pleasures of a fully equipped yacht is the ability to watch satellite TV from your stateroom or salon every time you are on the water. With KVH’s powerful and sleek TracVision TV8, you can count on high-performance tracking and excellent reception (including HDTV programming) no matter where your favorite cruising grounds are found. The 81 cm (32 inch) diameter antenna features an expanded coverage footprint so you can enjoy hundreds of channels of uninterrupted, crystal-clear digital entertainment with top-quality sound. 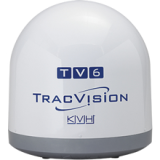 Description: KVH’s rugged 60 cm (24 inch) TracVision HD7 antenna is a breakthrough in marine satellite TV design. The system simultaneously tracks DIRECTV’s Ka- and Ku-band satellites so you receive high-definition programming from DIRECTV on your boat or yacht exactly the way you enjoy it at home. 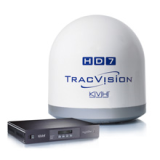 Description: The TracVision HD11 offers an unmatched suite of groundbreaking technologies, including 4-axis stabilized tracking, KVH’s TriAD™ Ka/Ku multi-band technology, and an advanced Universal World LNB, which enables the TracVision HD11 to be easily reconfigured to track any of the more than 100 satellites contained in its Worldwide TV satellite library. Best of all, it’s simple to use thanks to the free iPad®, iPhone®, and iPod touch® apps. 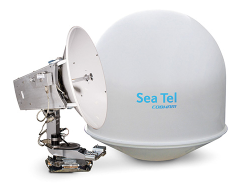 Description: The Sea Tel 80 TV features an 83cm antenna in a 108cm diameter frequency tuned radome that is designed to minimize signal loss and add to the high quality viewing on offer. Description: Sea Tel 100 TV features a 101cm antenna in a 136cm diameter. Sea Tel 100 TV will slot right in. 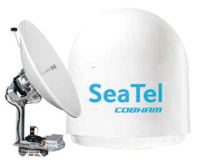 Other features such as the advanced programmable LNB and integrated DVB-S2 tuner for reception and identification of DVB-S2 and DVB-S satellite broadcasts ensure that when you choose the Sea Tel 100 TV, you get one of the most convenient yet advanced maritime TV solutions available today. Description: The Sea Tel 100 TVHD antenna system is an advanced dual-band solution that features a new 3 port feed and LNB that are capable of simultaneously receiving all three of the main satellites that DIRECTV® broadcasts its High Definition and Standard Definition programming on. Description: The Sea Tel 120 TV features a 124cm antenna in a 166cm diameter frequency tuned radome that is designed to minimize signal loss and add to the high quality viewing on offer. Description: The Sea Tel 120 TVHD antenna system is an advanced dual-band solution that features a new 3 port feed and LNB that are capable of simultaneously receiving all three of the main satellites that DIRECTV® broadcasts its High Definition and Standard Definition programming on. Description: For offshore platforms and deep sea vessels crossing the oceans, SAILOR 90 Satellite TV World delivers reliable, truly global television reception. Description: Sea Tel 4004 Satellite TV is a powerful 40-inch satellite TV antenna bringing your favorite programs to you on the open water and over the roughest seas. Description: Sea Tel 5004 Satellite TV is a high-performance 50-inch TV-at-Sea antenna which guarantees uninterrupted global satellite television and radio programming even on the roughest seas. The UA Features Unlimited Azimuth (UA) range for uninterrupted satellite television reception regardless of how many turns a vessel makes.. Description: Sea Tel 6004 Satellite TV is a 60 inch antenna and the most powerful Ku-Band system in its class, delivering clear digital signals for global satellite TV. Description: The 2.1-meter Sea Tel ST88 Satellite TV system delivers seamless satellite TV and music programming via Ku or C-Band to large vessels operating in coastal regions. 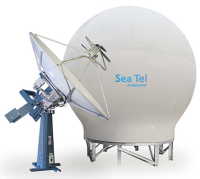 Description: Users requiring a large offshore operating area choose Sea Tel ST94 Satellite TV, a 2.4-metre dual band TV-at-Sea system with class-leading reflector, radome, RF components and pedestal. Description: Sea Tel ST144 Satellite TV is our 3.6-metre flagship TV-at-Sea system providing the largest offshore operating area and compatibility with all satellites. 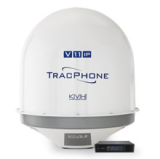 Description: For satellite Internet and phone anywhere in the world, the reliable and economical solution is the KVH TracPhone V3-IP paired with the Iridium Pilot. 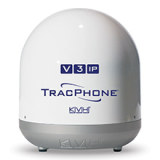 The 39 cm (15.5 inch) diameter TracPhone V3-IP is the world’s smallest maritime VSAT, designed exclusively for the world’s No. 1 maritime VSAT service – mini-VSAT Broadband. Advanced ArcLight® spread spectrum technology enables the V3-IP’s extremely compact design. 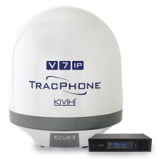 Description: Bring your connected life onboard with KVH’s compact 60 cm (24 inch) diameter TracPhone V7-IP antenna and the worldwide mini-VSAT Broadband network. 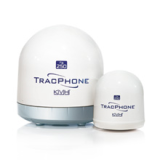 Delivering high-speed Internet with data rates as fast as 512 Kbps up and 3 Mbps down, and crystal-clear voice, the TracPhone V7-IP is the ideal way to stay in touch with family and friends via Internet, email, and phone, all while enjoying your time at sea. 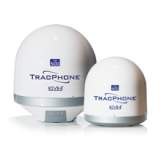 Description: TracPhone® V11-IP uses one compact 1.1 meter (42.5 inch) diameter antenna to effortlessly access the C- and Ku-band satellites of the world’s No. 1 maritime VSAT network – mini-VSAT Broadband. 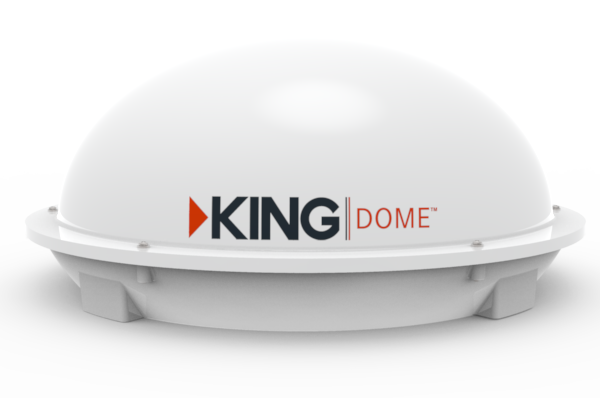 It seamlessly switches between the services, automatically locking onto Ku-band service in most parts of the world, and immediately switching to C-band service when Ku-band service is unavailable because of geography or extreme weather. 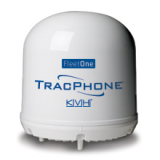 Description: Enjoy the benefit of satellite Internet and phone connections while on the water even from small boats with KVH’s most basic satellite communications antenna system: the TracPhone Fleet One, with Inmarsat airtime service. Measuring just 28 cm (11 in) diameter and weighing only 4 kg (9 lbs), the TracPhone Fleet One will fit where larger systems never could. 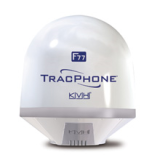 Description: The TracPhone FB150 antenna is the smallest in KVH’s family of Inmarsat FleetBroadband-compatible TracPhone systems, perfect for leisure boats. 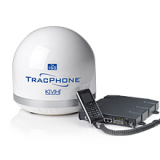 The fully stabilized TracPhone FB150 offers IP data connections up to 150 Kbps and simultaneous voice and SMS service, all via Inmarsat’s trusted FleetBroadband network with its I-4 satellite constellation. Description: The powerful TracPhone F77 marine satellite communications system provides access to Inmarsat Fleet’s Integrated Services Digital Network (ISDN) channel and Mobile Packet Data Service (MPDS) via Inmarsat’s globalbeams, ensuring uninterrupted voice, data, and fax service. Plus, you enjoy added flexibility thanks to the TracPhone F77’s compatibility with shipboard PABX systems as well as onboard networks (when connected to an IP router). Now up-to-date weather reports or maritime chart and navigational updates are available virtually anywhere you travel! Description: Fully automatic Maritime satellite. 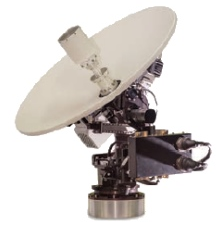 Versatile, rugged dual mode Line of Sight (LOS) and Satellite Communication (SATCOM) antenna. 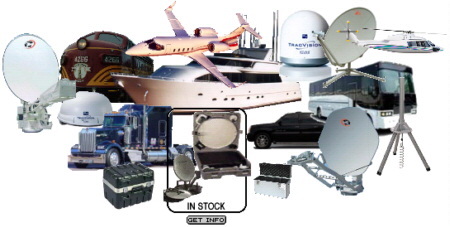 In one payload, communications can be established from ship to satellite, ship to ship, and ship to aircraft/helicopter. Description: Mobile telemetry, communications, electronic warfare, and radar antenna systems. maritime, offshore energy and other commercial applications. Ground-based, transportable, mobile or shipboard (gyro stabilized). Description: The antenna system has been qualified through strenuous military grade environmental testing. 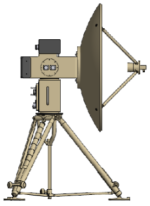 Shock testing (using MIL-STD-810 simulating guns firing), endurance vibration testing (using IEC 60068 simulating personnel movement and engine excitation), and EMI testing (using MIL-STD-461 simulating electronic warfare) have all proven this antenna withstands the rigors of the world theater. Description: Satellite communication antenna with the advantage of miniaturization and portability. Tactical control systems available for submarines. Description: Satellite communication antenna with the advantage of miniaturization and portability. Available for submarines. Description: DirecTV programming was introduced into scheduled service on August 9, 1996, on Delta Air Lines "Spirit of Delta" B-767-200. Revolutionary, affordable lens antenna design. U.S. Patent pending. Flown daily over entire CONUS region. Complete installation kits available. Compressed encrypted digital audio and video broadcast directly into aircraft in-flight from DirecTV or Dish Network satellites in geostationary orbit. Signals are decompressed and decoded in the aircraft and routed to video monitors. 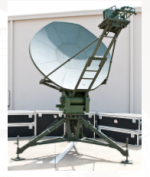 Patented Datron antenna is steered to track satellites via Datron/Hughes-Avicom developed ARINC 429 based system. Description: Industry leader in live In-Flight DBS TV. The DBS-2000 antenna system has been in operation on a major U.S. airline since August 1996. DBS-2400 is the simultaneous dual polarity upgrade to DBS-2000. Compatible with programming from DirecTV and Dish Network. Unique, patent pending, method of adjusting for linear polarity signals makes DBS-2400 adaptable to other DBS satellite services worldwide. DBS-2400 incorporates state-of-the-art digital. Description: The receiver with built in Received Signal Strength Indicator (RSSI) allows the antenna to rapidly scan the sky for all available signals and quickly point to the desired airborne asset, eliminating the delay of external modem decoding of the signal. Embedded amplifiers on transmit/receive at all bands allow a full communications system with only the addition of external DC power and a modem. Description: The AT-20 Dual Axis slotted waveguide array is designed for use in airborne and ground Tactical Common Data Link (TCDL) applications. 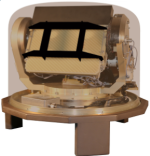 The AT-20 features a Dual Axis Positioner and a slotted waveguide array antenna. The slotted waveguide array has antenna gain of 17 dBi at the user output connector. 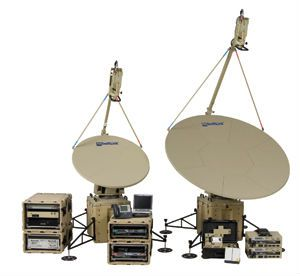 Description: AVIATOR UAV 200, a revolutionary new solution from Cobham SATCOM, redefines UAV satcom connectivity by integrating everything into one compact, lightweight box. Weighing just 1.45kg., AVIATOR UAV 200 is a remarkable 76% lighter than anything comparable on the market - yet still delivers Inmarsat Class 4 services, up to 200 kbps data and full, real-time control of data channels. Real-time surveillance just got lighter! Description: Satellite communication antenna with the advantage of miniaturization and portability. 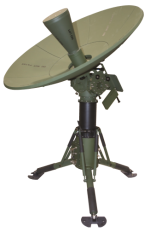 Antenna is designed for use in airborne and ground Tactical Common Data Link (TCDL) applications. Mobile telemetry, communications, electronic warfare, and radar antenna systems. Description: The AirTRx 34 and 46cm parabolic antenna systems are part of a series of innovative airborne stabilized VSAT antenna systems, providing quality broadband communication via satellite to various airborne platforms. Designed to accommodate the current and future needs of the airborne market, AirTRx is built to empower mission and business-critical applications. AirTRx™ supports Ku, Ka and X bands; featuring outstanding RF performance and dynamic response under virtually any operating environment. Description: The AirTRx 60cm parabolic antenna system is part of a series of innovative airborne stabilized VSAT antenna systems, providing quality broadband communication via satellite to various airborne platforms. Designed to accommodate the current and future needs of the airborne market, AirTRx is built to empower mission and business-critical applications. AirTRx™ supports Ku, Ka and X bands; featuring outstanding RF performance and dynamic response under virtually any operating environment. Description: The AirTRx 25LP is a 25cm elliptic antenna system, part of a family of innovative airborne stabilized VSAT antenna systems, providing quality broadband communication via satellite to various airborne platforms. Designed to accommodate the current and future needs of the airborne market, AirTRx is built to empower mission and business-critical applications. AirTRx™ supports Ku, Ka and X bands; or Ka/Ku Auto Switch, featuring outstanding RF performance and dynamic response under virtually any operating environment. Description: The system’s brushless DC motors and servo controls have been sized to accommodate the various array configurations. Servo controls are configured with full motion controllers which can be configured to operate in torque, velocity or position mode via serial (RS-422) or analog (+/-VDC) interface. High accuracy (16 bit) position resolution provided. 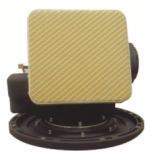 Description: The AT-10 single axis fan beam antenna is designed for use in airborne and ground Tactical Common Data Link (TCDL) applications. 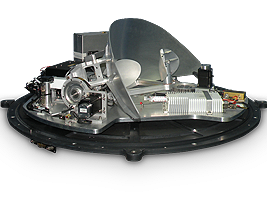 The AT-10 features a wide angle elevation fan beam antenna using a unique horn/RF interferometer design approach. It is ideal for aircraft/helicopter applications where a lightweight and simple control interface is necessary. Description: The RailTRx is a field proven platform supporting a variety of stabilized train antenna system configurations in Ku and Ka bands. As a common platform, it is inherently designed to accommodate the current and future needs of the train market. With a track record of dozens of operational systems, RailTRx features outstanding RF performance, system availability and high immunity to environmental electromagnetic interferences. Description: Ideal solution for situations on-the-go. This 3 meter pull along prime focus dish comes complete with trailer and hardware for easy fast deployment on the move. Larger dish better performance and portability. Several options. Description: The TCC Carrier is the ideal solution for situations on-the-go, requiring an easy to access data satellite system. The TCC Carrier is compatible with all F and XF series mounts. 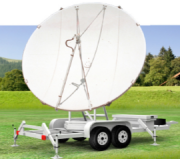 The TCC Carrier's custom made trailer All dish antennas are available in different feed and LNB configuration. Description: Ground Data Terminal. The 3.1 & 3.9m system provides a complete solution for mobile communications. Its versatility allows the system to be configured to meet various customer applications, including In-motion. Description: Portable ODU (outdoor unit) Deployable Communications Satellite Systems - Instant on Internet - Push button automatic Internet dish systems. 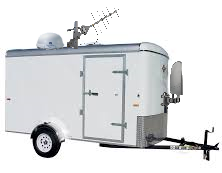 Multi-Purpose satellite communications trailer. Systems can be man packable, transportable via cases, mounted on trailers, fixed site, roll compensated gimbal mounted for shipboard or airborne applications. DBS-Wikipedia Communications satellite-Wikipedia Telecommunication-Wikipedia Broadcasting-Wikipedia Antennas-Wikipedia Parabolic-Wikipedia Satellite Dish-Wikipedia Satellite Television-Wikipedia Our systems cover all bands, S-Band - C-Band - X-Band - Ku-Band - Ka-Band - W-Band - Q-Band - V-Band - DBS-Band - Tri-Band - S-Band - UHF-Band - L-Band - Multi-Band. Custom bands and configurations are also available. Integrated assemblies can be designed from 1 to 60 GHz and can include both waveguide active and passive components, such as waveguide harmonic filters, waveguide couplers, detectors, low noise amplifiers, high power amplifiers, waveguide switches, coaxial switches, waveguide circulators, etc. All dish antennas are available in different feed and LNB configuration. S-Band, C-Band, X-Band, Ku-Band, Ka-Band, W-Band, Q-Band, V-Band, DBS-Band, Tri-Band, S-Band, UHF-Band, L-Band and Multi-Band as available options. Other products include Pulsed Products - Military Satcom - Ring-Loop - Block Upconverters - Inductive Output Tubes (IOTs) - Ring-Loop TWTs - Multi Pulsed Products - Minis - CW Oscillators - Pulsed Oscillators - Coupled Cavity - RF Decks - Power Couplers - Inductive Output Tubes (IOTs) - Klystrodes - Broadcast - Scientific - Non-broadcast Applications. K2D110w - K27 - millimeter wave - Power Couplers - oscillator power-amplifier systems - redundant or combined systems. 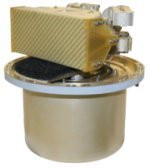 - coherent radar chains - cathode or an electrode - multi-stage depressed collector - Millimeter Wave - Gyrotrons - Oscillators - Klystrons - Coupled Cavity - Fully qualified to MIL-E-5400 environment - and Couplers. Maritime, offshore energy and other commercial applications - Non-autotracking antennas - Manually steerable antennas. Telemetry units. Automatic Systems can be supplied as ground-based, transportable, mobile or shipboard (gyro stabilized). Flyaway Earth Stations, Government Communications, Fixed and In-Motion Earth Stations. 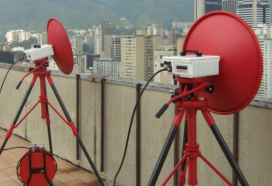 Portable Microwave Links Available in all frequency bands.